1. If the light were not in your eyes, dear Mr. Brooks, you would understand better how happy your little Helen was when her teacher explained to her that the best and most beautiful things in the world cannot be seen nor even touched, but just felt in the heart. 3. As selfishness and complaint pervert and cloud the mind, so love with its joy clears and sharpens the vision. 4. It is wonderful how much time good people spend fighting the devil. If they would only expend the same amount of energy loving their fellow men, the devil would die in his own tracks of ennui. 5. What we have once enjoyed we can never lose. A sunset, a mountain bathed in moonlight, the ocean in calm and in storm — we see these, love their beauty, hold the vision to our hearts. All that we love deeply becomes a part of us. Our beloved ones are no more lost to us when they die than if they were still laughing and loving and working and playing at our side. Truly, life is overlord of Death and Love can never lose its own. 6. We live by each other and for each other. Alone we can do so little. Together we can do so much. Only love can break down the walls that stand between us and our happiness. 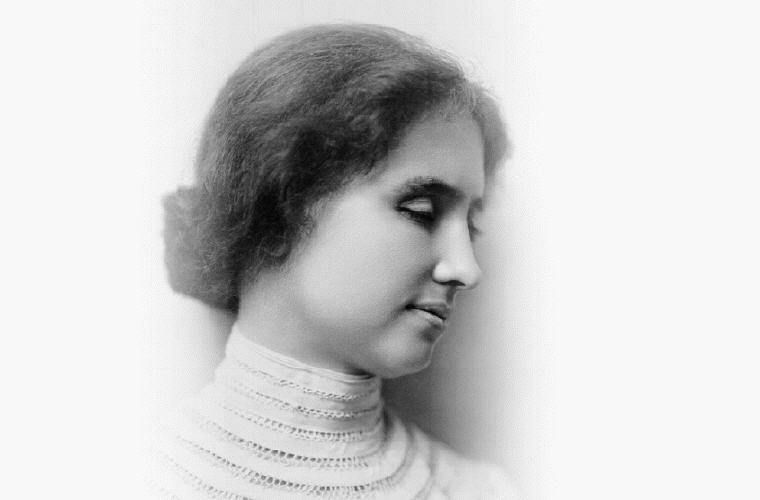 Excerpt from Wikipedia: Helen Adams Keller (June 27, 1880 – June 1, 1968) was an American author, political activist and lecturer. She was the first deaf and blind person to earn a Bachelor of Arts degree. The story of how Keller’s teacher, Annie Sullivan, broke through the isolation imposed by a near complete lack of language, allowing the girl to blossom as she learned to communicate, has become known worldwide through the dramatic depictions of the play and film The Miracle Worker. 1. The only real blind person at Christmas-time is he who has not Christmas in his heart. 2. No doubt the reason is that character cannot be developed in ease and quiet. Only through experience of trial and suffering can the soul be strengthened, vision cleared, ambition inspired, and success achieved. 3. I do not want the peace which passeth understanding, I want the understanding which bringeth peace. 4. Security is mostly a superstition. It does not exist in nature, nor do the children of men as a whole experience it. Avoiding danger is no safer in the long run than outright exposure. Life is either a daring adventure, or nothing. 5. I am blind and have never seen a rainbow, but I have been told of its beauty. I know that its beauty is always broken and incomplete. Never does it stretch across the heavens in full perfection. So it is with all things as we know them here below. Life itself is as imperfect and broken for everyone of us as the span of a rainbow. 6. We invite needless suffering when we entertain an exaggerated idea of our own suffering. Why should we be spared the chastening rod which all mortals pass under? Instead of comparing our lot with that of those who are more fortunate than we are, we should compare it with the lot of the great majority of our fellowmen. It then appears that we are among the privileged. 7. People do not like to think. If one thinks, one must reach conclusions, and conclusions are not always pleasant. 8. If books are not life, I do not know what they are. In the writings of poets, sages, prophets, is recorded all that men have seen, heard, and felt. Having all this in the grasp of my two hands, my means of observing what is going on in the world is not so very limited, after all. 9. I never smell daisies without living over again the ecstatic mornings that my teacher and I spent wandering in the fields, while I learned new words and the names of things. Smell is a potent wizard that transports us across a thousand miles and all the years we have lived. 10. I used to think–when I was small, and before I could read–that everybody was always happy, and at first it made me very sad to know about pain and great sorrow; but now I know that we could never learn to be brave and patient, if there were only joy in the world. 11. My life has been happy because I have had wonderful friends and plenty of interesting work to do. I seldom think about my limitations, and they never make me sad. Perhaps there is just a touch of yearning at times; but it is vague, like a breeze among the flowers. The wind passes, and the flowers are content. 12. I have for many years endeavored to make this vital truth clear; and still people marvel when I tell them that I am happy. They imagine that my limitations weigh heavily upon my spirit, and chain me to the rock of despair. Yet, it seems to me, happiness has very little to do with the senses. If we make up our minds that this is a drab and purposeless universe, it will be that, and nothing else. On the other hand, if we believe that the earth is ours, and that the sun and moon hang in the sky for our delight, there will be joy upon the hills and gladness in the fields because the Artist in our souls glorifies creation. Surely, it gives dignity to life to believe that we are born into this world for noble ends, and that we have a higher destiny than can be accomplished within the narrow limits of this physical life. 13. Face your deficiencies and acknowledge them; but do not let them master you. Let them teach you patience, sweetness, insight. True education combines intellect, beauty, goodness, and the greatest of these is goodness. When we do the best that we can, we never know what miracle is wrought in our life, or in the life of another. 14. Your success and happiness lie in you. External conditions are the accidents of life, its outer trappings. The great, enduring realities are love and service. Joy is the holy fire that keeps our purpose warm and our intelligence aglow. Work without joy shall be as nothing. Resolve to keep happy, and your joy and you shall form an invincible host against difficulties. 15. I long to accomplish a great and noble task; but it is my chief duty and joy to accomplish humble tasks as though they were great and noble. It is my service to think how I can best fulfill the demands that each day makes upon me, and to rejoice that others can do what I cannot. 16. The highest result of education is tolerance. Long ago men fought and died for their faith; but it took ages to teach them the other kind of courage — the courage to recognize the faiths of their brethren and their rights of conscience. Tolerance is the first principle of community; it is the spirit which conserves the best that all men think. 17. Everything has its wonders, even darkness and silence, and I learn, whatever state I may be in, therein to be content. 18. Faith is the strength by which a shattered world shall emerge into the light. 19. Believe, when you are most unhappy, that there is something for you to do in the world. So long as you can sweeten another’s pain, life is not in vain. 20. Optimism is the faith that leads to achievement; nothing can be done without hope. 21. … although the world is full of suffering, it is full also of the overcoming of it. 22. No matter how dull, or how mean, or how wise a man is, he feels that happiness is his indisputable right. 23. One can never consent to creep when one feels an impulse to soar. 24. I want to say to those who are trying to learn to speak and those who are teaching them: Be of good cheer. Do not think of to-day’s failures, but of the success that may come to-morrow. You have set yourselves a difficult task, but you will succeed if you persevere, and you will find a joy in overcoming obstacles — a delight in climbing rugged paths, which you would perhaps never know if you did not sometime slip backward — if the road was always smooth and pleasant. Remember, no effort that we make to attain something beautiful is ever lost. Sometime, somewhere, somehow we shall find that which we seek. We shall speak, yes, and sing, too, as God intended we should speak and sing. 25. Self-culture has been loudly and boastfully proclaimed as sufficient for all our ideals of perfection. But if we listen to the best men and women everywhere … they will say that science may have found a cure for most evils; but it has found no remedy for the worst of them all — the apathy of human beings. 26. Strike against war, for without you no battles can be fought. 27. We differ, blind and seeing, one from another, not in our senses, but in the use we make of them, in the imagination and courage with which we seek wisdom beyond the senses. 28. So much has been given to me I have no time to ponder over that which has been denied. 29. A happy life consists not in the absence, but in the mastery of hardships. 30. It all comes to this: the simplest way to be happy is to do good. 31. It is for us to pray not for tasks equal to our powers, but for powers equal to our tasks, to go forward with a great desire forever beating at the door of our hearts as we travel towards the distant goal. 32. Many persons have a wrong idea of what constitutes true happiness. It is not attained through self-gratification but through fidelity to a worthy purpose. Happiness should be a means of accomplishment, like health, not an end in itself. 33. I stood still, my whole attention fixed upon the motions of her fingers. Suddenly I felt a misty consciousness as of something forgotten — a thrill of returning thought; and somehow the mystery of language was revealed to me. I knew then that “w-a-t-e-r” meant the wonderful cool something that was flowing over my hand. That living word awakened my soul, gave it light, hope, joy, set it free! There were barriers still, it is true, but barriers that could in time be swept away. I left the well-house eager to learn. Everything had a name, and each name gave birth to a new thought. As we returned to the house every object which I touched seemed to quiver with life. That was because I saw everything with the strange, new sight that had come to me. 38. Avoiding danger is no safer in the long run than outright exposure. The fearful are caught as often as the bold. 1. I learned that it is possible for us to create light and sound and order within us, no matter what calamity may befall us in the outer world. 2. Love is like a beautiful flower which I may not touch, but whose fragrance makes the garden a place of delight just the same. 3. Never bend your head. Always hold it high. Look the world straight in the eye. 4. Self-pity is our worst enemy and if we yield to it, we can never do anything good in the world. 5. No pessimist ever discovered the secret of the stars or sailed an uncharted land, or opened a new doorway for the human spirit.